Capital of an arrondissement in the department of Meurthe-et-Moselle, France, with a Jewish population dating from the thirteenth century. Among the scholars who were once residents of this city may be mentioned R. Eliezer of Toul, the author of tosafot; and his brother Abraham, a pupil of Rabbi Isaac the Elder of Dampierre and identical, according to Gross, with Abraham of (read ), one of the scholars to whom Meïr ben Todros Abulafia of Toledo addressed his epistle assailing the doctrine of the resurrection as set forth by Maimonides. In 1708 the Bishop of Toul petitioned the French government to expel from Nancy the Jewish bankers Samuel and Solomon Levy, Jacob Schwob, Isaiah Lambert, and Moses Alcan, but his efforts were unsuccessful. 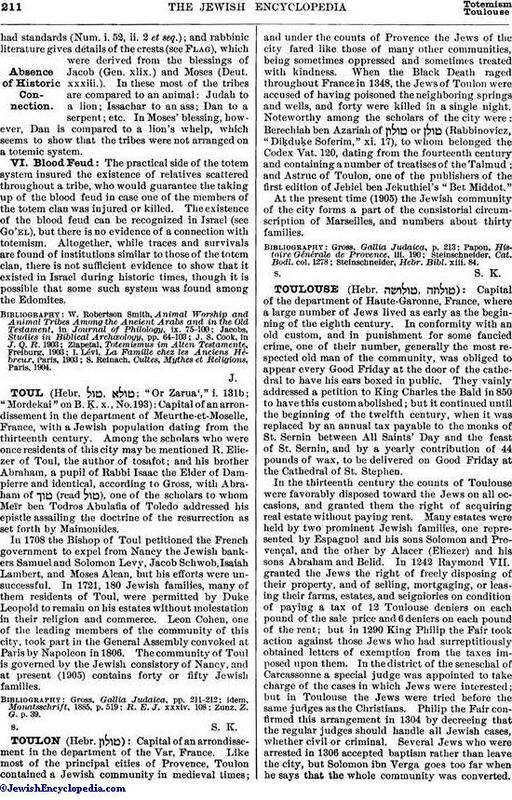 In 1721, 180 Jewish families, many of them residents of Toul, were permitted by Duke Leopold to remain on his estates without molestation in their religion and commerce. Leon Cohen, one of the leading members of the community of this city, took part in the General Assembly convoked at Paris by Napoleon in 1806. The community of Toul is governed by the Jewish consistory of Nancy, and at present (1905) contains forty or fifty Jewish families. Zunz, Z. G. p. 39.